Here Sheldon throws out the welcome mat for illegal aliens. In a year that has one newspaper referring to a candidate’s tactics as “sleaziness,” other candidates walking out of a debate, a county commissioner from elsewhere quitting her job there one week signing up to run for auditor here, not to mention a reporter being falsely accused of endorsing a candidate, I thought the 2014 election might have reach peak-unique. Au contraire! I obviously don’t give the American political machinery enough credit for ingenuity and creativity. We may do a larger story for Tuesday, but I wanted to get this much out there sooner. 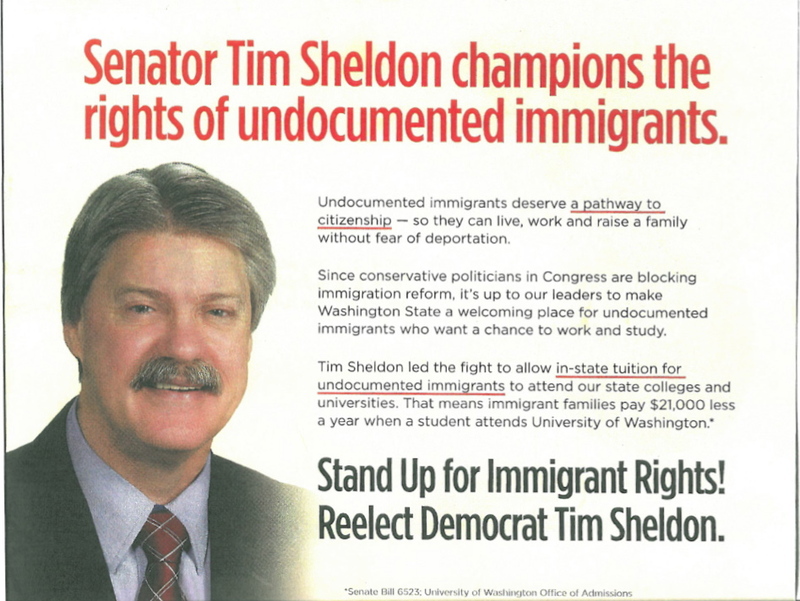 Voters in the 35th Legislative District are getting mailers praising state Sen. Tim Sheldon, D-Potlatch, for his work in making it easier for “undocumented immigrants,” expanding federal health care reform and protecting reproductive freedom. Sheldon is running against another Democrat, Irene Bowling of Bremerton. The ads’ claims about Sheldon are true, technically, because Sheldon said in a debate he is pro-choice, though he favors legislation that would require parents be notified if their minor daughters plan to have an abortion. He also voted for the Washington version of the Dream Act, what the Majority Coalition Caucus called the “Real Hope Act.” It allowed children of parents who came here illegally to receive in-state tuition in Washington colleges. And he voted for a budget that expanded Medicaid coverage, though he earlier voted against a bill implementing the Affordable Care Act. The ads are paid for by American Values First, a Washington, DC-based organization described mostly on its own site as an outfit fighting voter suppression. It shares an address with the Democratic Legislative Campaign Committee. I’ve called the Public Disclosure Commission to get clarity on the rules. The Republican group accuses American Values of several state infractions, but the organization claims to be in the right, legally. What’s more, it claims to be sincere in its support of Sheldon. “American Values First is not a political committee, but rather a social welfare organization with a proven record of advocacy. American Values First agrees with Sen. Sheldon’s past votes seeking justice for immigrants, expansion of Obamacare, and women’s reproductive freedom. American Values First followed all applicable laws and filed all reports with the Public Disclosure Commission that are required of organizations of this type that sponsor such communications,” said Bill Burke in an emailed statement. The organization linked to PDC reports showing it has spent just over $20,000 for direct mail ads in Washington. We’ll update this when we have more information. I am an independent voter. I vote for the person, and not their “party”. My wife and I have voted for Tim Sheldon every election cycle to represent us in the 35th. This election he get 0 votes from our home. We have voted for Irene Bowling this time. We’ve known her for six years and she has bigger gonads than Sheldon, and she’s honest. Please vote for Irene.